The movement of digital literacies has been greatly accentuated among native and non-native English speaking countries especially in Asia. Thailand as well embraces the challenges of this phenomenon in the mainstream education. Therefore, language educators are not only initiating effective classroom practices or integrating diverse teaching pedagogies, but also enhancing a quality of teachers and educators for this drastic change. Within the context of globalization and fast growing technologies, language classrooms should be a venue for teaching and learning more about the technology aspects and promoting critical communicators. A communicator who is able to use the target language in culturally appropriate ways. Issues of digital literacies and critical literacy should be discussed and promoted in EFL/ESL classroom learning in the 21 st century. It is a means to making ELT learners more powerful/empowered language users. 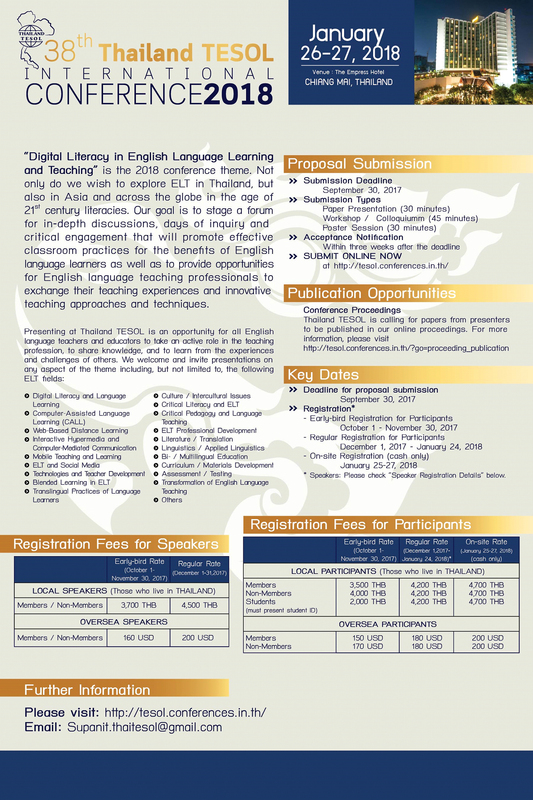 Technology community?, How can innovation in learning technologies enhance English language teaching and learning quality? and What challenges do teachers face in using the technologies in their practices?”. This conference therefore hopes to manifest multi-faceted aspects of digital literacies and language teaching and learning, and to share what is beyond the professional, significantly influencing teachers' personal life. These are to positively encourage any in the field of ELT to continuously walk in the colorful pathways towards professional excellence.